Samsung’s new laptop/tablet hybrid may be the best option for full time digital nomads and entrepreneurs living out of their suitcase. Or you may just be a techie that wants the option of a standard laptop combined with the convenience of a tablet. If you fall in these specific categories, you will appreciate the Notebook 7 Spin’s ability to house all of your work/play desires in one device. At first glance, it looks like a standard 15-inch laptop. But, as its name implies, the hinge system allows it to spin backwards, 360 degrees, into a touchscreen tablet. This feature lets you stop at any point while you are using the computer for viewing and operating options. While the single hinge is intended to make it easy to transform it back and forth from laptop to tablet as needed, the silver chassis with rounded edges makes it an attractive looking device too. Power comes from an Intel Core i7 with options of 12GB and 16GB. The 1 Terabyte hard drive and 128GB solid state drive places the Spin amongst the upper tier of hybrid devices. The Notebook 7 comes with just about every port you will need, including: Ethernet, HDMI, SD card and three USB ports — one of which is 3.0. Currently the market has many 360 degree hinged transformers, but Samsung (KRX:005930) understands that in order to disrupt the market new features are king. An HDR filter is one of the tech tools that sets the Spin apart from its competition. The “High Dynamic Range” mode lets you view content with greater clarity and contrast format, and the addition of the Nvidia 940MX graphics chip enhances those HD capabilities giving your presentation — or the latest video game — new life. Faster charging is another touted feature. In only 20 minutes, you can get up to two hours of power, and if you want 100 percent, you can achieve that in 90 minutes, the company claims. Power users are likely to think the convenience, power and functionality of this new device are well worth the $1,099.99 price tag. The Notebook 7 Spin can literally let you replace your tablet and desktop, which is what many of these users are looking for in their computing device. If you want a different configuration, you can get a $999 version that comes with 12 GB of RAM and no SSD, with everything else being the same. A 13″ screen version is also available for $799 with a 1080p display, Core i5-6200U CPU, 8GB of RAM and a 1TB HDD. Do You Really Need All The Features of the Samsung Notebook 7 Spin? 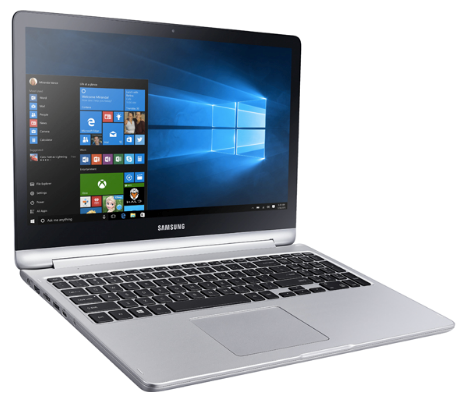 The Samsung Notebook 7 Spin may be overkill for the average business user who isn’t interested in all the bells and whistles — many connected with leisure use. And the price range is certainly much higher than other options that offer everyday needs in a single device. If you don’t need to have one device to act as both a laptop and a tablet you are better off going with a single-use product that is more suited to your lifestyle. The market currently offers other alternatives with more streamlined options: allowing you to pay only for what you need. You can find an array of choices within the Samsung family alone — from notebooks and tablets to full-scale laptops. When it comes to notebooks you can expect price points from $399 for the 11.6” Notebook M to $849 for the 15.6” Notebook 5. If you are considering the portability and functionality of a tablet, the Galaxy series offers its mid-range Android-based versions. The Galaxy Tab, a 9.6” 16GB model with standard features, is sold for an average price of $169 depending where you get it. It is an entry-level tablet so you will be limited as to what you can do with it. The largest tablet, size wise, is the Galaxy View at a whopping 18.4 inches and comes with an accompanying curved stand and a modest mid $300 price range. At the high-end of the Galaxy tablet range is the TabPro S, which is considered one of the best tablets in the industry. And at $749, you get a 12″ display and 128GB of storage along with other specs. 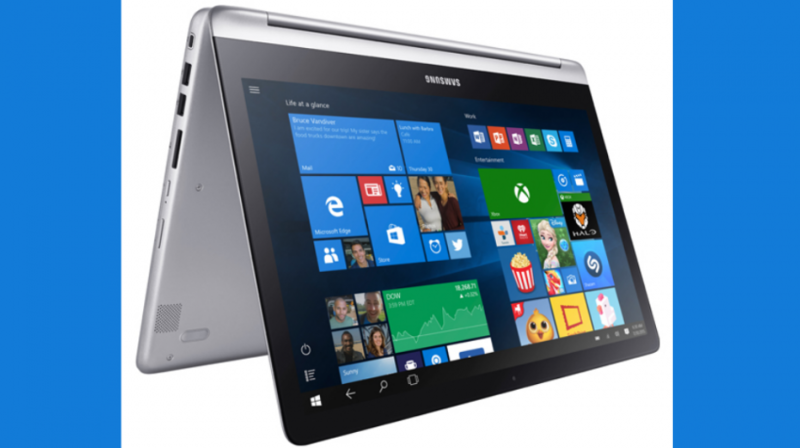 The Samsung Notebook 7 Spin is not for everyone, but there is a market for these type of powerful 2-in-1 computers, the Microsoft Surface is proof of that. The question is will Samsung make any headway in a segment that is getting more crowed by the day?